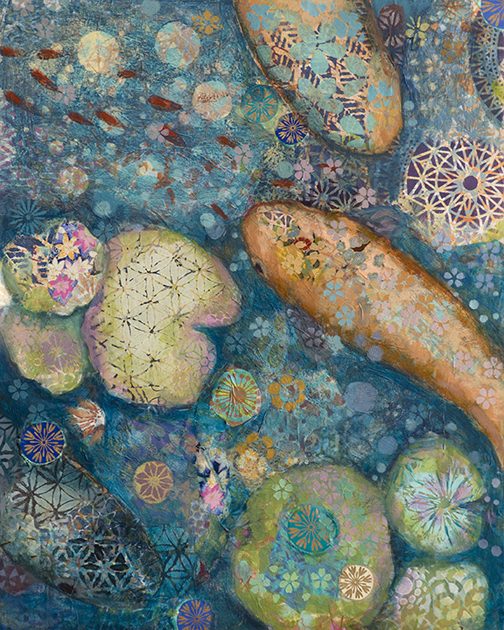 First Friday at Fifth Avenue Art Gallery will feature Renee´Decator and her solo exhibit, Dreams & Wishes, Birds & Fishes. The opening reception will be on First Friday, October 6, from 5:30 pm through 8:30 pm. Renee´will be present to talk to you about her work and share her enthusiastic spirit. On Saturday, October 14, at 1 PM, plan to come to the gallery where Renee´ will be offering an artist's talk. She will be discussing her techniques and material choices in her work. This is a free event and open to the public. Decator attended Artquest School of Art & Design in Volusia County, Florida, before moving to Brevard County in 1995. She has been a member of Fifth Avenue Art Gallery for 10 years and has chaired many charitable exhibitions since joining the gallery. She works at her studio in downtown Melbourne, Florida. She loves tropical gardening, which is often an inspiration for her work. Dreams and Wishes, Birds and Fishes will open on October 3 and run through October 29. Fifth Avenue Art Gallery is located in the Eau Gallie arts district of Melbourne, Florida. All events are free and open to the public.